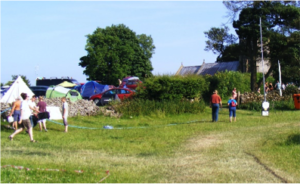 The festival campsite is situated above Priddy green, it surrounds the Village hall and the Church. From almost all of the site there are good views of the rather lovely surrounding countryside and in particular of the ancient barrows on the next rise (and one in the camping field!). Festival goers come to the campsite and make it their own each year. Most of the campsite is freestyle- with some groups of people in tents, caravans and motor homes meeting up to attend the festival- but often it’s in ones and twos. One of our fields is just for tents. 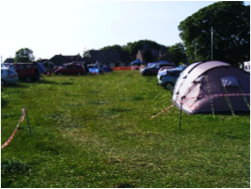 Our experience is that most people are very considerate when coming back to their tents after enjoying the festival. Camping is available only at the time you book weekend tickets- we have been selling out of camping tickets early for some years, so try to book for Priddy Festival as soon as you can. Stewards don’t pay for festival tickets, or for camping – ever thought of being a steward? If you are too late to book camping this year, then see below for alternative accommodation!